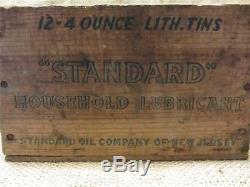 Vintage Standard Oil Company Wooden Crate Sign > Antique Old Gas RARE 8522. Vintage Standard Oil wooden crate. This crate would look great in your mancave, get creative! This fine piece is quite collectible. The crate is 9" x 6" x 5 1/2 wide. Standard Oil Company of New Jersey, Standard Household Lubricant. Good condition for its age. It has some moderate to severe staining and wear. See description above for further info on the condition. The item "Vintage Standard Oil Company Wooden Crate Sign Antique Old Gas RARE 8522" is in sale since Monday, December 23, 2013. This item is in the category "Collectibles\Advertising\Gas & Oil\Gas & Oil Companies\Chevron & Standard Oil".